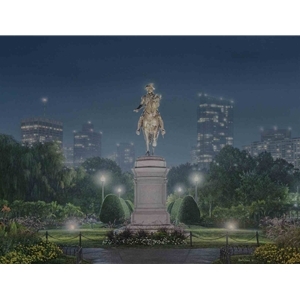 Sculpted from bronze by Thomas Ball in 1869, the George Washington statue located in Boston’s Public Garden is considered one of the foremost equestrian statues in the United States. Here, we see a poised General Washington in the role he was more comfortable assuming; not as a politician but that of a military leader. With a largely untrained and ill-prepared army pitted against one of the greatest military powers in the world, he draws his sword and confidently leads the way to freedom.